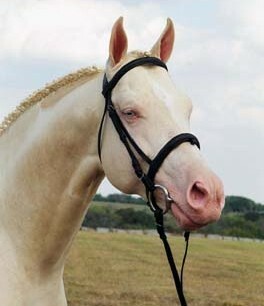 Cremello Thoroughbred stallion El Dorado. Notice the blue eyes and pink muzzle typical of cremellos. Thanks to Milynda Milam of Red Fox Farm, Texas, for allowing me to dispaly this photo of her fabulous stallion (see also the last photo).